Rush Skeleton-Weed is a thin, spindly plant which reaches a meter in height. It starts from a basal rosette of leaves and branches extensively, often forming a weedy thicket. The plant is mostly 0.4-1.5 m tall, appearing somewhat rush-like. The lowermost part of the branching stem bears distinctive large, spreading to slightly descending, reddish hairs. The upper stem is hairless. Cut surfaces of stems and leaves release milky sap. The early-deciduous basal leaves are well-developed, pinnately cut, 5-13 cm long, 3.5 cm wide, and strongly resemble dandelion leaves. The stem leaves are linear, 2-10 cm long and 1-8 mm wide, and often falling off. The upper leaves are often reduced to scale-like bracts. The flower heads are scattered along the branches, commonly with 9-12 yellow, strap-shaped "petals" (ray florets) per head. 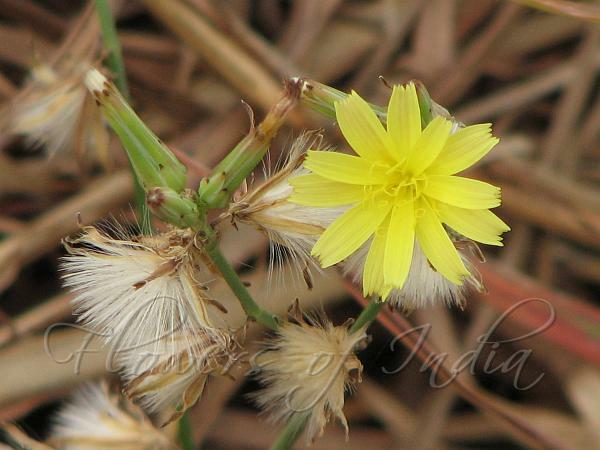 The involucre of bracts is 9-12 mm high, and thinly clothed with white, curly, hairs. The fruit is pale brown to almost black, 3-3.5 mm long, with five broadly rounded longitudinal ribs separated by grooves. The tip of the fruit body bears small pointed bumps then 5 small scales at the base of a long, slender beak, which bears the pappus of hair-like bristles. It reproduces by seed but also by cloning itself at the root; tilling of soil and chopping up plants actually help this species disperse by sectioning and distributing root parts. This plant is considered a very troublesome weed in many areas. 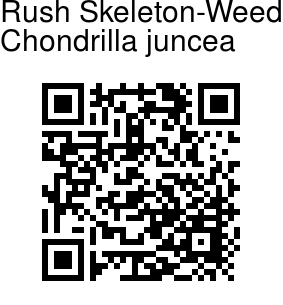 Rush Skeleton-Weed is native to the Mediterranean region of Europe, North Africa, and Asia Minor. Found flowering: March. Photographed in Kanha National Park, Madhya Pradesh.